With global equities at record highs and the post-US debt ceiling deal rally likely to be mostly spent, you would think that markets are most likely to consolidate. Not necessarily. This week’s calendar alone has an unusually high dose of potentially market moving events. A wave of belated US data releases, as well as some significant European and Chinese data, could provide volatility from all three regions. In addition, we have the third week of the quarterly earnings reporting season. The first 3 weeks usually fix the tone, so the third week of earnings season is quite capable of driving markets higher or lower if a clear bullish or bearish theme emerges by Friday. When leading global indexes like the S&P 500, our preferred risk appetite barometer (see here for why), are at historical highs, our technical indicators are limited to a variety of momentum gauges that can only offer clues about the strength of that momentum and thus the likelihood of the current uptrend’s continuation barring some unforeseen obstacle. As of Friday, the overall picture from a variety of momentum indicators is firmly bullish, in all time frames from 4 hour to one month candle charts. For example, let’s look at the daily chart below, which is representative of the other time frames mentioned above used by traders and investors with planned holding periods well beyond those of the short term and intraday traders. 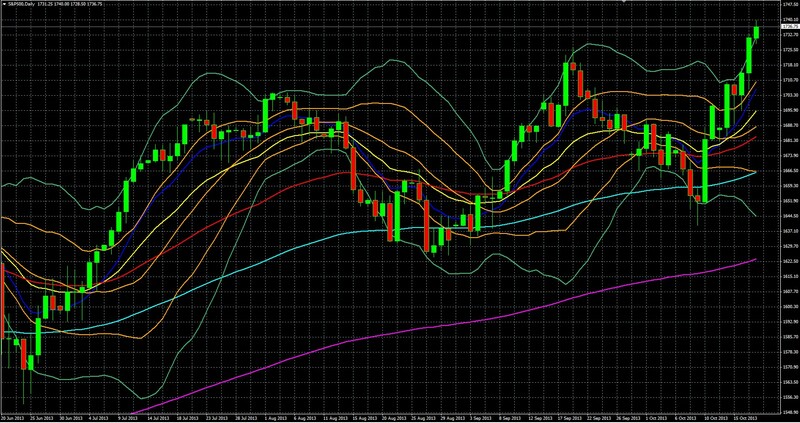 The index is firmly within the double Bollinger band buy zone, bounded by the uppermost green and orange lines (the upper 1 and 2 standard deviation Bollinger bands). These are our favorite momentum indicator. Those seeking a quick and practical introduction to double Bollinger bands can refer to our special report 4 RULES FOR USING THE MOST USEFUL TECHNICAL INDICATOR, DOUBLE BOLLINGER BANDS, or see chapter 8 of our book, The Sensible Guide To Forex, for an even more in depth examination. You can get at least a partial look at it at for free using amazon’s “Look Inside” feature for Chapter 8 here. You want to know about these. All moving averages are trending higher, most importantly the shorter term 10(dark blue) 20 (yellow) day EMAs, as well as the longer term 50 (red) 100 (light blue) and 200 (violet) day EMAs. Whenever stocks are hitting all-time highs, the natural question expectation is that indexes take some time moving sideways or lower, until fundamentals provide some new “Viagra” to stimulate new buying and justify a bullish further thrust higher. Now that you’ve had your dose of Freudian allusions for the month, let’s look at the likely key fundamental drivers of market sentiment for the coming week. Anticipated damage to the already weak recovery from the recently concluded debt ceiling fight, which includes an ongoing sequester (automatic federal spending cuts), a 16 day federal government shutdown and related delayed salaries to federal workers, and the implied threat of a repeat performance in early 2014 that will keep many consumers and businesses cautious. So while markets may take some time consolidating, we’ve already seen that stocks have been able to grind higher without the usual supporting fundamentals like materially improving growth or earnings. However without some new ray of sunshine from earnings, a big data surprise from the wave of belated releases coming this week, the EU, China, or elsewhere, the more likely scenario for the coming week is to see risk assets consolidate their gains. As we noted in our recent post on last week’s lessons for this week here, earnings thus far have been mediocre, with only the financial sector really looking good. Fortunately the tone for earnings season is not yet set until the end of the third week, this week. Expectations are for more of the same meh performance; however markets are expecting better guidance and analyst reports for Q4 and beyond. Roughly 28 % of the S&P 500 report earnings next week. Top Dow components Caterpillar (CAT.N), McDonald’s (MCD.N), Boeing (BA.N), Microsoft (MSFT.O), UPS (UPS.N), AT&T (T.N) and DuPont (DD.N), among others, as well as Netflix (NFLX.O) and Amazon.com (AMZN.O). Once again, markets will be especially focused on prospects for increased earnings via top line revenue growth because that indicates sustainable earnings increases, rather than earnings growth by non-sustainable sources such as cost cutting, share buybacks, or asset sales. Q3 results are not likely to send the indexes higher. At 14.6, the S&P’s forward price-to-earnings ratio is near its highest in four years and is just below its long-term mean of 14.9. The P/E multiple has risen throughout the year, however earnings growth has stayed flat, and forecasts expected to fall in coming months. The end of the 16 day federal government shutdown means we have a wave of belated but still noteworthy data coming from the reopened US government. Most important will be the monthly jobs and related reports, and home sales Monday and Tuesday. There will be other US home sales data, durable goods reports, and U of Michigan consumer sentiment later in the week. Thursday: After Tuesday, Thursday’s the big day. The early trading could certainly be influenced if there are any surprises in the China’s HSBC manufacturing PMI report. Even if not, a wave of EU manufacturing and services PMI (sentiment) reports, as well as US new home sales and weekly jobless claims could be market moving, especially if they present a bullish or bearish themes that give these mostly second tier reports added weight. Friday: German Ifo, US durable goods, UK preliminary GDP and US revised UoM consumer sentiment are the noteworthy reports that close out the week. They provide us with information that is not only a critical reading of US economic health but also one that is vital for speculating about Fed sentiment. They’re coming out on a Tuesday rather than their usual Friday. Normally, a Friday release limits follow through speculation as the weekend hits before markets have much chance to react before having a weekend to digest the results. This time around, the data will have more time to play out its potential influence. On the other hand the data is already badly outdated. For more on the coming week, see here and here.